How can I set up a great Outdoor Entertaining Area using Awnings? Are you searching for a home addition that will help you better enjoy your outdoor space in the spring and summer? You can set up the perfect outdoor entertainment area by using awnings. Awnings are low maintenance structures you can use for a variety of outdoor living applications. In fact residential awnings have a way of stepping up the wow factor of homes that feature decks and patios because residential awnings offer additional comfort to outdoor living. If you can see yourself relaxing and entertaining guests all spring and summer, you will want to design an outdoor living space that’s just as comfortable as your home interior. With the right layout, you can enjoy breakfasts, BBQs and drinks right under your awnings. If you want great flexibility for your outdoor living space, have retractable awnings installed to give you the best flexibility for outdoor entertainment all year round. Retractable awnings can offer you full control over how much sun you want for your entertainment area and shield your party guests and family from rain and wind. Remember, the goal is to establish a wonderful comfort zone. Carroll Awning Company can help you expand your outdoor living space any way you want it with custom awnings. We can tailor your retractable awnings to fit your exact personal style. Select your awning fabric. Tell us where you want your retractable awnings. We understand the important of entertaining guests in a comfortable outdoor living space. 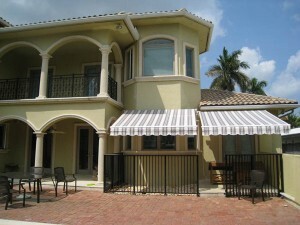 We will provide the shade with custom designed retractable awnings. All you have to do is set up your patio furniture and other outdoor living accessories. If you are ready to get your outdoor entertainment area in order, hire Carroll Awning Company to get the job done right.